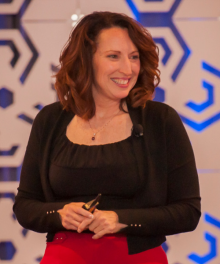 Eliz Greene’s high energy and high content keynotes hook the audience with her story of surviving a heart attack at age 35, while seven-months pregnant with twins, then sends them home ready to do something different. For more than a decade, Eliz has been on a mission to inspire busy people to pay attention to their heart health. Recognizing stress as an essential and often under-addressed risk factor, Eliz conducted a research study on job stress. The results were shocking. Contrary to conventional wisdom, there are no gender differences in what causes stress at work. This revelation is a call-to-action for individuals and employers to address the root cause of job stress rather than treating the symptoms. Eliz’s conference closing keynotes and employee workshops are described as riveting, compelling, and fun. They are the perfect fit for anyone dealing with overwhelm, needing to increase productivity, and protect the health of key players. Eliz is an author and writes a Top Health and Wellness Blog. She was named as a Top Influencer on Stress. A national spokesperson and advocate for the American Heart Association, Eliz received the Heart Hero Award in 2010.